For other uses, see Yenice (disambiguation). 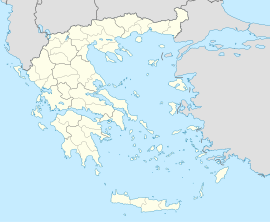 Genisea (Greek: Γενισέα) is a town in the Vistonida municipal unit, within the municipality of Abdera in the Xanthi regional unit of Greece. It is the seat of the municipality Abdera. According to the 2011 census, the population of Genisea was 2,185 inhabitants. Under the Ottoman names "Yenidje" or "Yenidze" (from Turkish Yenice Karasu), Genisea was famous for its superior Oriental tobacco, especially suited for cigarettes. It lent its name to the Yenidze tobacco factory building in Dresden and to the British Yenidje Tobacco Company Limited. ^ a b c "Απογραφή Πληθυσμού - Κατοικιών 2011. ΜΟΝΙΜΟΣ Πληθυσμός" (in Greek). Hellenic Statistical Authority. This Eastern Macedonia and Thrace location article is a stub. You can help Wikipedia by expanding it. This page was last edited on 22 December 2017, at 06:10 (UTC).